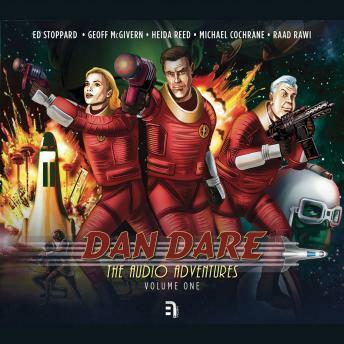 This excellent collection includes not only the first three stories from season one of Dan Dare’s Audio Adventures, but also the bonus feature ‘New Worlds’, containing the work of film composer and musician Imran Ahmad. Unable to return to Earth, Dan Dare and the crew of the Anastasia head to the desolate planet Mars, where Dan's estranged Uncle Ivor is part of a research team working on a top-secret archaeological dig; but when they find the base wrecked and the scientists missing, Dare, Digby and Professor Peabody soon discover that the Red Planet is not nearly as dead as everyone thought and that Ivor’s expedition has woken an army of deadly insect-creatures that threaten to swarm and engulf the Earth… Dare must stop the aliens, but can he really resort to genocide in order to save the human race? When a distress call summons the crew of the Anastasia to the burning wilderness of Mercury, they are reunited with their old ally, Sondar. He tells them of the beleaguered Mercurians who are held in thrall to a cruel new taskmaster - the Mekon! The exiled Mekon is rallying his forces, plotting a desperate revenge against his former homeworld of Venus and his hated enemy, Colonel Dan Dare! Includes the work of film composer and musician Imran Ahmad, who previously worked with B7 Media on the award-winning The Martian Chronicles. His credits include the background music score for the critically acclaimed road-trip zombie movie The Dead and its sequel The Dead 2: India and the 2015 thriller, Never Let Go. Audio dramatisation based on the Eagle Comic strip ‘Dan Dare’ created by Rev. Marcus Morris and Frank Hampson. Dan Dare: The Audio Adventures © B7 Enterprises Limited 2017. All rights reserved. Dan Dare TM © Dan Dare Corporation Limited 2017. All rights reserved. Dan Dare word mark and logo are trademarks of the Dan Dare Corporation Limited and are used under license. The moral right of the Dan Dare Corporation Limited and B7 Enterprises Limited to be identified as having paternity of this work has been asserted. All characters in this production are fictitious and any resemblance to real persons, living or dead, is purely coincidental. All rights of the manufacturer and owner of the recorded work reserved. Unauthorised public performance, broadcasting and copying of these digital recordings is prohibited.